What gain should those BC109s be ? "Sw B > out to Q1 base on board"
its labeled as "Sw A" on the picture. That's because on the picture you do need to connect Sw A because that is based on using the cap daughterboard in the layout. Sw B is only used if you prefer to solder the caps to the switch directly, then the connections change as both poles are being used, hence the changes being noted in the post text. Gooood!!! waiting for it for some time now. Is there a schematic of this? Hi, would it not be possible to ditch the rotary switch and just use a blend pot between the lowest (8n2) and highest (470n) capacitor to have a smooth sweep between the two? Similar to what the DAM Drag N' Fly? If so, then you would not need to wire up a big rotary and use all those caps..... Thoughts? Yes that wouldn't be a bad idea, you could do that and the results won't be too far away. My only reservation is I never think it is quite as crisp that way though (if that's the right word for it). You obviously don't have a true change in capacitance, just one side of the blend pot becoming more or less dominant depending on position with the two sides effectively being mixed together. It would certainly make a good alternative though if someone wanted something quite similar in a build that would be more 1590B friendly. Personally I tend to always favour one or two settings with something like this, and never even hear the others again after first trying it out, so using a DPDT on/off/on toggle with 3 caps soldered across the poles will give 3 distinct settings and use up a lot less space than the rotary switch. Yeah, there DPDT is a good idea. Ive wired something like that up many times before but looking at the current input wiring for this circuit, I'm a bit confused. I would I add a 3-way dpdt on the input instead of the 6-way rotary? Thanks! Sorry, so many typos there! And it wont let me go back and edit. I was trying to say that I'd like to add the 3-way DPDT rather than the 6-way rotary, but I'm a bit confused on how to do that looking at the current wiring. Any help would be appreciated! You could have an input cap of 100n, 147n or 200n. Ah great, right where "Sw A" is. Thanks! then you would have 47n, 94n or 227n and get a better spread. Does pin 7 is soldered into pin 1 on this draw? No. The 8n2 cap is soldered between pins 1 and 7 if you're mounting the caps on the switch. If you're using the cap daughterboard, all the connections are shown, and the second pole isn't used (so no connection at all to pin 7). This looks pretty versatile, anyone know what that blue guitar is hes playing at 1:30 in the demo video btw? Apart from the input cap switch, this appears to be almost identical to the online schematics for the Colorsound OD, including (or rather, also not including) the "missing" cap from across the outer lugs of the bass pot. I removed an unnecessary cut at the end and didn't change the number, so yes just 12.
glenn. did you get a chance to try this build? Built it, works, so you can call it verified. However the Drive pot doesn't do too much in about 99% of its sweep. I swapped it to a B1K linear pot, it's better, but probably either a 500Ohm pot or a different taper would be better. I find the Bass control quite useless, it just adds more mud to your sound, and not more bass. The Treble control works alone as a quite versatile tone control there is no need for the Bass control. The input cap selection is a good idea, but I'll play a bit and will probably only chose two different ones. I'll omit the Bass control leaving only one fixed resistor in its place and then I'll be happy with the 4 controls: volume, drive, tone (now treble) and a two-way toggle switch for the input cap. Having a problem with this one. I am getting signature and tone variance through the daughter board so I'm good there. Once the signal hits the main board all goes to crap. I get only a minuscule amount of sound. If I pull the far right transistor shown on the layout I get a big increase in volume but it's just clean signal. When I replace it the sound dis shapers again. I went so far as to go over all of the lines between the copper traces of the board to ensure nothing was bridged but I get the same results. Anyone else getting this or have any ideas? Sorry, I was trying to say I was getting SIGNAL and tone variance. Just to troubleshoot my own build (since I'm having NO tone change using the switch), how did you wire the signal path from input jack to mainboard? Guitar signal to daughterboard input / SW A to mainboard "SW A"? Done!, I figured out my prior issue after metering the resistors. I went stupid for a few and had put 1K5s in place of the 150Ks. Replaced them with the correct values and she came to life. I agree with Csaba, the 10k gain pot is a waste. I used a 1K and ran a 5.1K in parallel with the pot. This renders the gain pot value as roughly 836K. When down all the way you have just a hint of effect which cleans up with a slight volume drop on the guitar. And of course all the way up you get the nasty you want. This seemed like the best to my ears. Using the parallel resistor you can fine tune it to your liking. How can i get more gain out of this one? thank you very much,im going to give it a try. this stacks very nice with the superbolt as long as i keep the gain down on the black forest. Hi,owning a Black Forest, I thought it'd be interesting to take a look inside this beast. At my surprise, the drive knob is a C5K in mine, though the board itself is labelled B10K. So I made some soldering taking the C5K back, putting a B10K in and listened. With the B10K, all the gain comes in the last quarter and it's nearly impossible to be precise. The Rev Log pot is thus justified. So I went for some more experiment in putting a C10K instead. I thought it might be interesting to have the same resistance (as on advised on the board) but with a different taper. I was pleased so I stayed there. I just finished this one up using a B2K pot for the gain control, much better than the 10k. I'll have to try out the C5k or C10k, thanks for the info. The pedal works great but if I have the gain and treble dimes it oscillated like crazy. I wouldn't have it set like that anyway but I'd still like to have it right, any suggestions? I wired up the C10k drive pot and its works perfectly now. Regarding my previous post, it wasn't oscillation, it was feedback. I'd definitely recommend the C10k for the drive pot, very smooth transition from a cleaner boost to full on drive and everything in between. Anyone have any pics of a completed build? Namely a gut shot? I'm wondering if maybe I inverted the collector/emitter positions of the transistors. My build is a paperweight at the moment: it bypasses fine and the LED comes on when the effect is engaged, but no sound comes out. If you dime the Vol, you can hear the slightest hiss like it wants to pass sound through it but there's no signal to pass through. I finished by build late last night, so haven't had a chance to trace out the issue yet. I had that same problem! Got it solved. Guitar signal -> SW A AND daughterboard "input". Plus that I connected SW A to main board "SW A". Guitar signal - > daughterboard "input"
SW A -> main board "SW A". All the rest is like on the pic. Though I got mine basically working there's still a problem; the rotary switch doesn't seem to affect the sound in any way. Firstly, I thought that I had miswired it somehow. I checked and double-checked the whole thing - no faults found. I thought that maybe the tone change is just so subtle that I'm having trouble hearing it. That's not the case, 'cause everyone should hear a distinct tone change when toggling the switch between 1st and 6th position. Pots and the circuit itself DO work, so there's something going on with the daughterboard and/or the switch. BTW: I used different cap values than on Mark's layout (I used 22n, 47n, 100n, 220n, 470n and 1uF) and substituted the 10kB Drive pot with 10kC. Hey did you ever get this working? I was unsure of the wording as well, here is what I did and confirmed by nocentelli on the madbean forums where I asked for help also: SWA on board to SWA of Rotary, Input of daughter board to Effects In or (fx send) of switch (for mine using the madbean bypass wiring it was middle lug) that was all and it works perfect and there is a perceptible difference between capacitors. Yet to be confirmed, on my part. Seems that sometimes it's good to put a problematic build aside and let it cool, then after "a while" pick it up again and see that you've been blind as a bat :D Meaning, I found a bridge between emitters of Q2 & Q3. I'll get to test it later today. But that switch thingy you described is just what I meant, so that should be ok. The pinouts are shown in the layout. What kind of transistors did you use? Hey everybody! Build this one and have a problem. My bass knob effects mainly the volume and just a little the bass. Thanks for your help. Greetings from Austria. 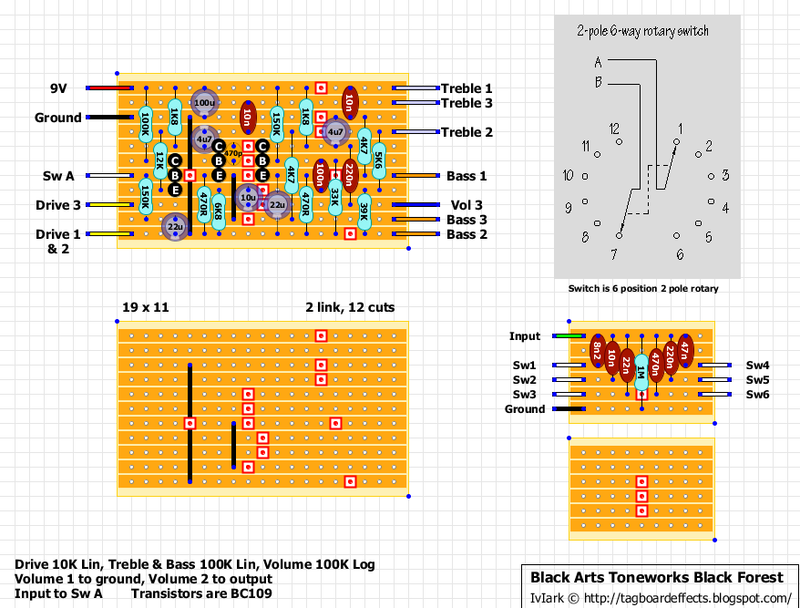 I added a 100n to lugs #1&#3 of the BASS pot like some, but not all, Colorsound schematics I've seen. This layout matches the Black Forest pcb, but the bass control doesn't work well that way. It's fine now. I also used a reverse taper gain pot. what do i connect to swA on the rotary?? ?